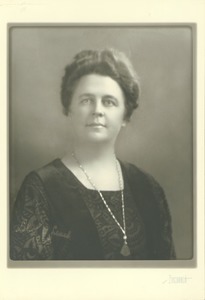 Formal head and shoulders portrait, of Lottie A. Leach (Mrs. Joseph A. 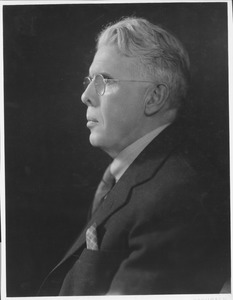 ), member of the Advisory Council of Women; and a trustee from 1932-1936 and 1945-1952. "Bachrach" printed below image; "Mrs. Leach" hand printed on verso. Actual image size is 9 x 7 in. 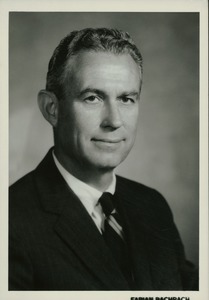 Formal head and shoulders portrait of Victor P. Buell, Professor of Marketing. 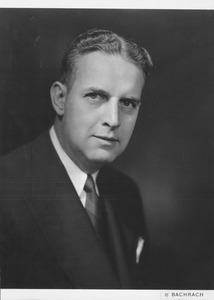 Formal head and shoulders portrait of John Martin Deely (Trustee, 1946-1953). "© Bacharach" printed on lower front corner. "statehouse" scribbled on back. "News Service, University of Massachusetts, Amherst, Mass." and "Bachrach" with copyright information stamped on back.